Please join me in congratulations the Team Canada Deaf Women Curlers (Brenda Davidson, Sarah Rabu, Donna McLeod, Sylvia Sigurdson, Sally Korol) and Men Curlers (Cliff Beaulieu, John Gessner, Marc Comte, Shawn Demianyk, David Morton) on their path to the Gold Medal at the 18th 2015 Winter Deaflympics in Khanty-Mansiysk, Russia that will be held March 25 – April 5, 2015. 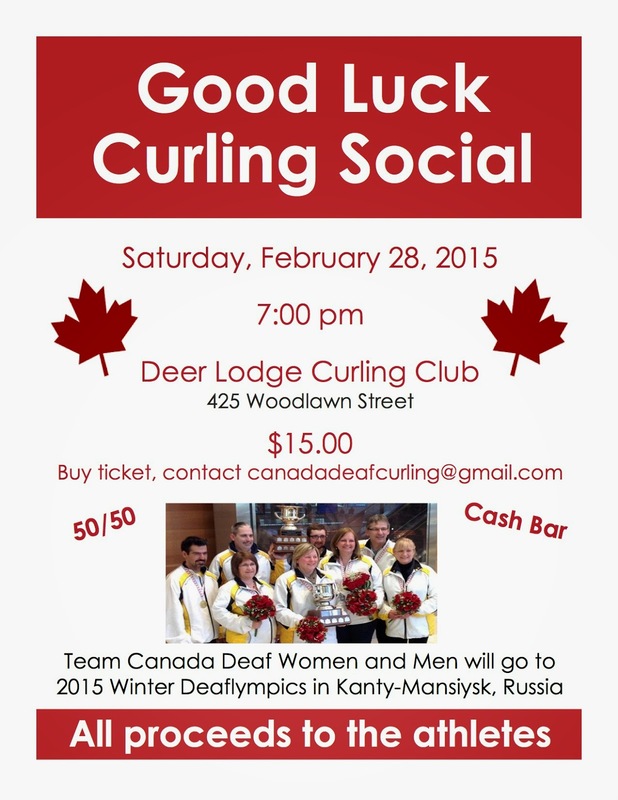 Come on down and congratulate/support them at the Good Luck Social taking place at the Deer Lodge Curling Club on February 28, 2015 – 7:00 pm. Admission is $15.00 per person. If you are interested in purchasing tickets - contact canadadeafcurling@gmail.com – let’s get together and cheer them on their journey! !